It is one of the most unusual primates on the planet—famed for its large eyes, big ears and thin, bony finger used for probing. Often persecuted as a harbinger of evil, the aye-aye has fascinated scientists, in particular how and why it evolved such unusual features. But now a new study has, for the first time, measured the extent to which the endangered aye-aye has evolved similar features to squirrels, despite being more closely related to monkeys, chimps, and humans. When two aye-ayes were first brought back to Europe from their native Madagascar by French explorers in 1780, they were "ranked with the rodents" and believed to be "more closely allied to the genus of squirrel than any other". By the mid-19th Century the aye-aye had been correctly identified as a primate, but its squirrel-like appearance is often cited as a striking example of "evolutionary convergence", or how unrelated species can independently evolve the same traits. Now, using techniques developed in collaboration by researchers at the University of York, a new study has used high-resolution microCT scanning to image the skulls of the two species, mapping and modelling the level of convergence in their physical features. The findings suggest that the demands of needing to produce a high bite force with the two front teeth—in the squirrel for cracking nuts and in the aye-aye for biting into tree bark to feed on wood-boring beetle larvae—have not only led to the aye-aye evolving the ever-growing incisors characteristic of rodents, but has also given it a squirrel-like skull and jaw. The study shows how lifestyle and ecology can have such a strong influence on the way a species looks that they can almost override ancestry. Senior author of the study, Dr. Philip Cox from the Department of Archaeology at the University of York and the Hull York Medical School, said: "Examples of convergent evolution can be seen throughout nature—for example, despite belonging to separate biological groups, dolphins and sharks have converged in body shape due to their shared need to move efficiently through the water. 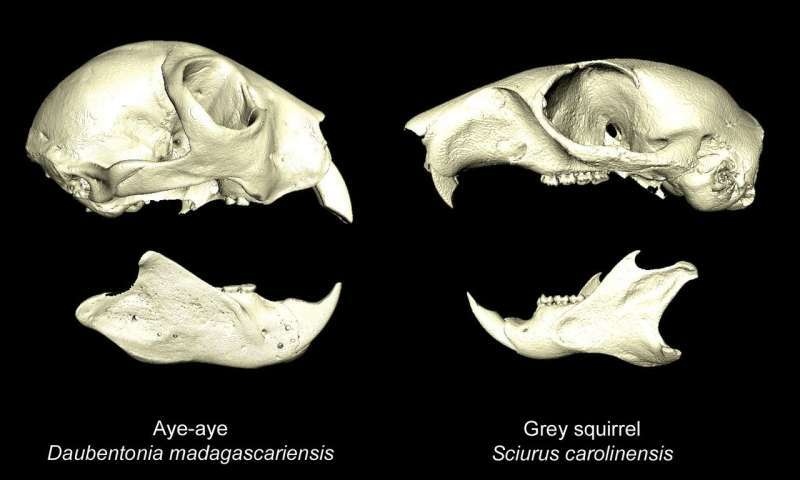 "Aye-ayes and squirrels have become an iconic example of convergence because of their similar teeth, but our study has shown for the first time that the evolution of their skulls and jaws has also converged. "Our analysis suggests that the skulls of both species have not evolved simply to house their teeth, but that the distinctive shape may be what allows them to exact a high bite force. The shape of the skull is what makes the aye-aye look so similar to squirrels in particular." Using skeletons borrowed from the collections of natural history museums, the research team made 3-D reconstructions of the skulls and mandibles of the aye-aye and squirrel, plus a variety of other primates and rodents. They then took 3-D co-ordinates from these reconstructions and put this data into statistical software. Plotting the evolutionary trees of the two biological groups allowed the team to visualise how the evolutionary paths of the aye-aye and squirrel incline towards each other—showing the high degree of convergence in the skull and jaw, despite the completely different ancestry of the two species. Dr. Cox added: "Our study shows the extent to which functional pressures, such as having to eat mechanically demanding food, can significantly alter an animal's skeleton and result in distantly-related species evolving to resemble one another very closely".